As I have mentioned in a few earlier posts, chapters 8 & 9 of Matthew's gospel have been arranged in three sections of miracles, each with their own "triad" of miracles (i.e. a set of three connecting miracles). And sandwiched between each triad is a "narrative interlude" (i.e. a connecting story) about discipleship which launches the reader into the next triad. A post about this literary structure can be found here. (If you don't know what I'm describing, I recommend that you take a quick look at that post to see what I mean.) A post about the first narrative interlude can be found here, and some posts about the two following miracles within this central triad can be found here and here. The third and final miracle within this central triad -- Jesus healing a paralyzed man -- is what I will discuss in this post. I intentionally began this post by pointing back to the literary structure because there is a central theme woven through each miracle story that remains interconnected within each triad. This will be very important to remember as we sort through Matthew's story about the paralytic. 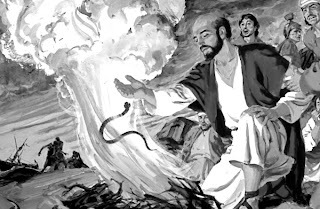 If you recall, Matthew launched this central triad of miracles with a narrative interlude which discussed two types of disciples: one was rejected by Jesus, and the other was accepted on a certain condition. Matthew describes the one who got rejected as a "scribe" and the one who was accepted as a "disciple" (Matt. 8:18-22). Immediately afterward, Jesus and his "disciples" get on a boat and head to "the other side" of the Sea of Galilee. Before they get to the other side, "Behold! There arose a great earthquake in the sea, so that the boat was being covered over with waves" (8:24). Jesus calms the sea and it's waves, but only after he is finished rebuking his disciples for being cowards. He even calls them "Littlefaiths!" After making it to "the other side" Jesus confronts two demonic-oppressors, and "Behold! They cried out, 'What have you to do with us, O Son of God? Have you come here to torment us before the time?'" (8:29). 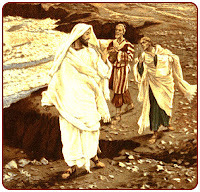 The demonic-oppressors beg Jesus for permission to flee from them, and again, Jesus unhesitatingly grants them permission. Immediately thereafter we find another startling exclamation made by Matthew: "Behold!" This repeated emphasis is intentional. Each "Behold!" is like a water buoy or a lighthouse in the sense that it serves as a signaling device that leads the reader from one side of the Sea to the other and back again. Notice carefully that after this second emphatic "Behold!" we immediately find the demons fleeing from Jesus into a herd of pigs and down into the sea to drown (8:32). Each "Behold!" is followed by something noteworthy and alarming, something dramatically connected to the lager journey of faith presented from one side of the Sea to the other. But in Matthew's story, this journey of faith & discipleship has not traveled round-trip yet. Jesus is is not back home yet. In fact, he hasn't even got back on the boat again! What occurs next in Matthew' story is important. After the demons beg Jesus for permission to flee from him, and they are granted their request, this causes the people to panic and alert a bunch of other people from their pagan city. And immediately we read again, "Behold!" This time it's followed by the city people coming out to meet Jesus, and when they see him, they beg him to flee from their country (8:34). And so, Jesus, seeing their faith like that of the demons who just begged for permission to feel from him, decides to leave peacefully. These are the accounts which Matthew highlighted for us as he leads us into the final miracle of this central triad: the miraculous healing of a paralyzed man. This fifth exclamation of "Behold!" is really interesting, especially when compared with the previous four signals. This exclamation is the first positive signal! 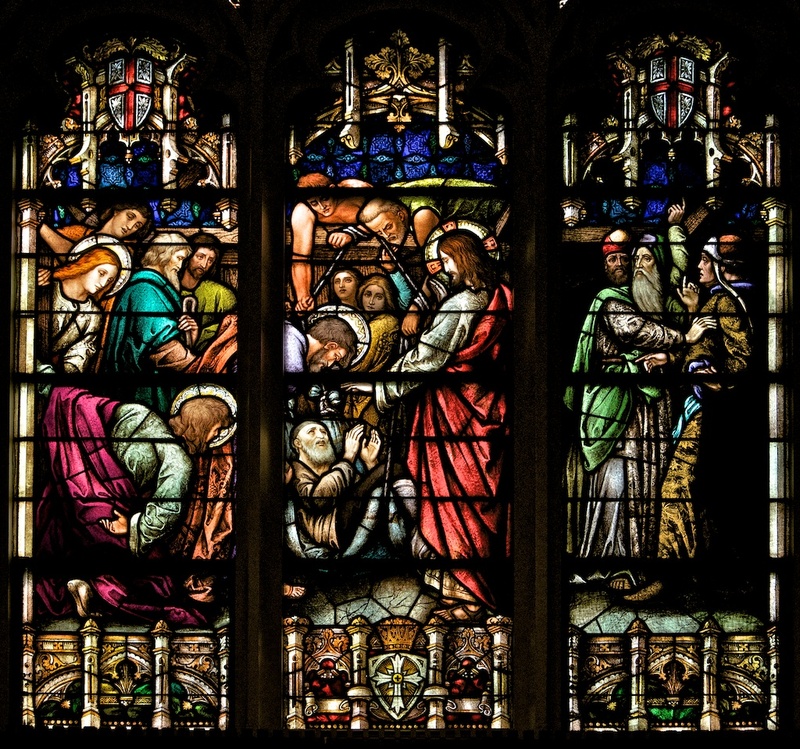 It's as though Matthew is leading his readers (us) to a reassuringly great faith, the faith of the paralytic and his friends who take the time and effort to bring a man to Jesus. In contrast with the faith of the city people on the other side of the Sea who begged Jesus to flee from them, the faith of these men is exceptional and noteworthy. But it's at this point -- which at first glance appears to be a climactic point in the larger story -- that Matthew has set us up for one more alarming account of great disappointment. 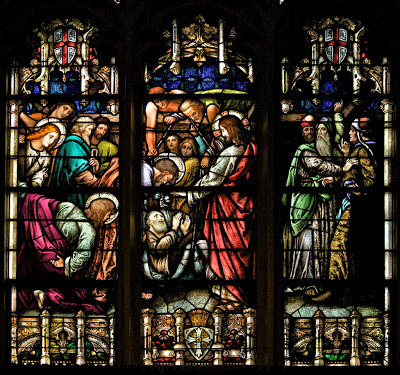 Just as the reader is able to envision Jesus' own excitement after seeing "their faith," Matthew glosses over "their faith" and immediately moves on to highlight a long, drawn-out confrontation between Jesus and the Scribes. I find it fascinating that in both accounts of Mark and Luke, we find a lot of extra details about who was carrying the paralyzed man and how many of them were carrying him, and how long it took them to get into the room where Jesus was, and because the entire house was crowded to the point of impossible access around the home, we learn how much effort these men took to bring a paralyzed friend to Jesus by cutting open the tiles of the roof and slowly lowering the paralyzed man into the house. In Mark and Luke, it is a very dramatic story with a sturdy balance between the faith of the paralytic with his friends and the Scribes with their friends. But in Matthew's account, all we get is a glimpse of great faith. It's heavily unbalanced in it's emphasis. All Matthew says is that "some people brought to him a paralytic, lying on a bed." That's a whopping eleven words! (The Greek only has six words!) Matthew simply grabs our attention with another "Behold!" and then glosses over "their faith" in order to talk about Jesus' confrontation with the Scribes. This leads me to believe that Matthew's main objective in this brief miracle-story is to illustrate the faith of the Scribes. At this point, I bet the first century Jewish readers of Matthew's gospel were cringing at the thought of what the scribes might say. I can just picture Jews in the first century, as they were reading Matthew's gospel for the first time, rolling their eyes and thinking to themselves, "Oh no! What kind of snide remarks are they going to say this time?" Can't you picture that too? Especially after Jesus approaches a paralyzed man! Because of various passages woven throughout the scriptures, it is well known that many Jews understood some connection between sin and God's curse upon sin in the form of death, disease, suffering, and physical affliction; but Scribes were notorious for sharing a cynical view about the relationship between physical affliction and God's curse. They probably viewed this paralytic as a man completely and hopelessly cursed by God, whereas Jesus clearly sees him as a man of faith. One can only imagine the fiery distain these scribes were feeling toward Jesus as he spoke comforting words of forgiveness. At first glance, our English translations appear to be pretty cut and dry. Jesus seems to be actively forgiving the paralytic, and the Scribes seem to be defending the honor of God, as they're supposed to. And if you were a faithful follower of the scribes and their teaching, you too could view their thoughts as being faithful. Yet Jesus accuses them publicly as thinking evil thoughts. They accuse Jesus of "blasphemy," but Jesus turns their accusation of "blasphemy" and points it right back at them. Why is Jesus treating them this way? Why is he reacting so abruptly? After all, what is so evil about defending the honor of God, which is what all the disciples of God are supposed to be doing? There's actually much more going on in Matthew' story, more than what ordinarily meets the eye. The subtlety of Matthew's story is that Jesus does not actively forgive the paralytic's sin. I repeat, in Matthew's account, Jesus is not actively forgiving the paralytic's sin. Jesus is merely speaking comforting words to build up his faith as he lies there paralyzed, and the Scribes assume the worst of what Jesus actually said, as though they knew Jesus' actual thoughts and intentions. They projected upon Jesus what they wanted him to mean. They presumed that Jesus was speaking forgiving words, thereby actively forgiving his sins, when he actually was not. And Matthew illustrates this for us in a variety of ways. First, notice that Jesus did not command, "Your sins, be forgiven!," nor did he say, "I forgive your sins," "I am forgiving your sins," or even "Your sins shall be forgiven." (And there are actual, ordinary ways of conjugating the Greek verbs in order to make these distinctions, yet Jesus chose to say something entirely different.) Jesus, in fact, spoke somewhat ambiguously. In Greek, what Jesus chose to say to the paralytic -- in the midst of a crowded house -- could mean both "Your sins are forgiven" and "Your sins are being forgiven." And notice carefully the difference between those two. The first statement, "Your sins are forgiven," is simply a way of indicating a forgiven status which the paralyzed man would naturally perceive as words of comfort. In a more modern setting, this would be like a firefighter declaring words of comfort directly to a father about his children that have already been rescued from a fire. The firefighter could say, "Your children are saved," and there would be no doubt in the father's mind that the firefighter intended to comfort him and remove all doubt in his mind about his children. There would have to be a huge mental blockade in the father's mind for him to interpret the firefighter's words as active saving (i.e. "Your children are being saved," which would actually leave some room for doubt). On the other hand, because the words which Jesus chose to use (and what Matthew chose to record) were somewhat ambiguous, the Scribes interpreted what he said, not as "Your children are saved," but rather, "Your children are being saved." Admittedly, it's difficult to confuse the firefighter's intentions when speaking in English, but that's because the English language is weakly inflective, using mainly the bare form of a verb. However, in Greek all verbs are highly inflective, and so you can convey both meanings ("are forgiven" and "are being forgiven") by only speaking one way, with one inflection; and Jesus chose to speak that one way with one slightly ambiguous inflection: "Your sins are forgiven." Further examination into the Greek text helps illuminate this conscious decision of Jesus to speak somewhat ambiguously. For example, when Jesus says "Have courage, my son," that is not ambiguous at all in the Greek. That is clearly a command in the Greek text. The same kind of intentional clarity is seen elsewhere in this story. When Jesus asks the scribes which is easier to say, "Your sins are forgiven," or to say, "Rise and walk," the words "Rise and walk!" are clearly commands in Greek, whereas the first saying, "Your sins are forgiven," is again an ambiguous declaration, a mere repeat of the exact same words he spoke to the paralytic. And so, this is Matthew's way of teaching us that Jesus knew what he meant by every single spoken word, and he also recognized that the Scribes interpreted what he spoke in a different way than his own intent. The Greek text, if extrapolated a bit more, is even more sharp and cutting. Jesus actually says, in effect, "But that you might know from now on that the Son of Man continually has authority on earth in order to forgive sins" -- he then said to the paralytic -- "Be Risen! Pick up your bed and go to your home!" I can imagine the scribes who challenged Jesus in their hearts, taking a small gulp when Jesus first asked them what was easier to say, "Your sins are forgiven" or "Rise and walk!" They knew that Jesus was challenging their thoughts about the relationship between sin, physical affliction, and God's healing forgiveness. But I bet the scribes took a really big gulp after Jesus followed that first question with one, and only one, ultimatum. Jesus says that they "might" know, but he then leaves them with only one way to show everyone that their knowledge of God is genuinely faithful. They are given a choice to either believe or reject the fact that God has given Jesus authority on earth, from that point forward, to be forgiving sins. Big gulp. And so Jesus commands the man, "Be risen!" And we know how the rest of the story goes. The man rises, picks up his bed, and walks to his house. And "when the crowds saw it, they were afraid, and they glorified God, who had given such authority to men" (Matt. 9:8). Now, there are a lot of lessons to learn from this true, historical story, only one of which is that disciples of the living and true God should never be characterized as interpreting others in worst possible light. Matthew describes those kinds of disciples as evil. But we also learn a lot more than this. If we take a few steps back and zoom out a bit, it isn't difficult to see the overall portrait of discipleship, especially as it's highlighted by the faith of 1st century Jewish scribes who were revered as "righteous" in the eyes of many devout Jews. The last time we learned about the faith of scribes was when Jesus began his journey across the sea. And it appears as though Matthew has brought us around full circle on this journey of faith. 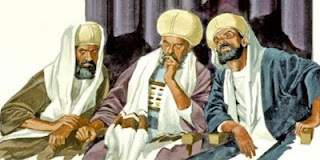 First there were two disciples who wanted to follow Jesus and get on the boat with him, but the "scribe" gets rejected. Then we find a story about the "little faith" of his disciples, followed by the faith of demons and their corresponding city, followed by the faith of the scribes who accuse Jesus of "blasphemy" for speaking comforting words to a paralyzed man. The faith of the scribes in the end is just as blasphemous as the scribe in the beginning and the demonic faith in between. Their faith in God is just as pretentious and dead as all those who choose not to follow Jesus or are rejected by him. Their faith is worse than the cowardly "Littlefaiths." Their faith is demonic. They want nothing to do with Jesus, just like the demonic-oppressors and the pagan-worshipers on the other side of the sea wanted nothing to do with him. Their faith, if left unchanged, is the faith of a demonic city doomed to rush headlong into a sea of drowning. Their faith brings no healing to Israel because God has not given them the authority which is highly esteemed in His eyes. Rather, He has given them what is highly esteemed in the eyes of dead men. God has not even given these scribes the authority to declare comforting words of forgiveness. 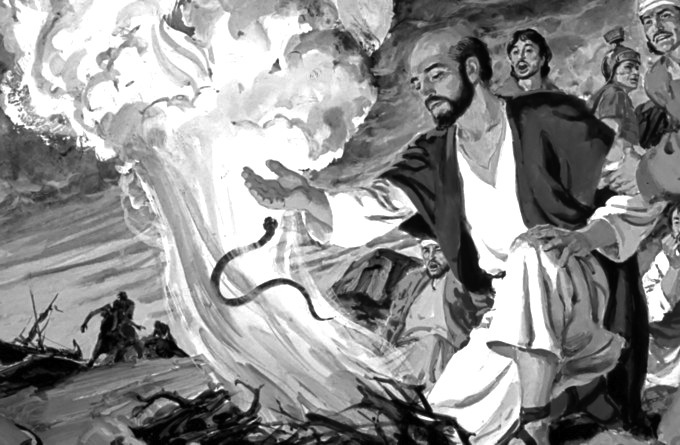 Instead, God exposed their false accusations as evil, their pretentious spirit as barbarous, and their skewed presumptions about Jesus' forgiving spirit as His own curse upon them.